In this blog posting, I'm going to show you how to setup Apple AirPlay on a router running TomatoUSB firmware. This will allow you to stream music from your iOS device or iTunes to speakers plugged into your router over your wireless network. If you're not familiar with Apple AirPlay or TomatoUSB, here's a good introduction on AirPlay and a link to the TomatoUSB website. I would go as far as saying, don't buy a router unless it's supported by TomatoUSB. This router is very similar to the Asus RT-N16 (same chipset) minus the extra RAM, larger Flash and external antennas. The instructions below (not including the flashing instructions) will also work for the Asus RT-N16, Linksys E3000 and most modern router with USB Ports that is supported by TomatoUSB ('Yes' in either the K26 or K26RT-N columns and has USB ports). *Recommended (Best model), typically $30-40. Go by the model number and not the name. On the models with only 1 USB port, you'll need a USB hub because we need two USB ports - one for USB sound adapter or USB speakers and one for USB Flash drive or USB hard drive. USB Flash Drive (>1GB) or USB Hard Drive. This tutorial will assume you're using a USB flash drive. Speakers - computer speakers, your home stereo system, iPod/iPhone dock with aux in. WARNING: you can brick your router if you flash the wrong firmware. The flashing instructions below are specific to the Belkin routers I mentioned above. If you're using a different router, please use the appropriate tutorial/instructions for your particular model. To install TomatoUSB, we first flash the router with DD-WRT and then from DD-WRT update to TomatoUSB. 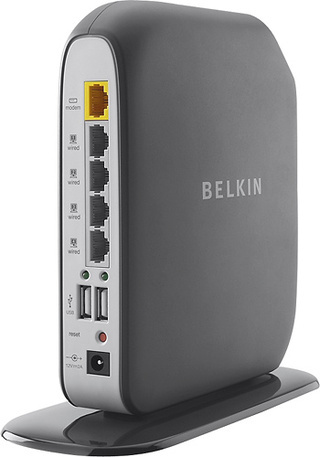 For these Belkin Routers, I would recommend the latest Big-VPN version, or BT-VPN if you want BitTorrent Client built into the firmware. I'm going to be using build 108 of the Big-VPN in this tutorial. 1) Unplug the router. Hold down the reset button while plugging in the router. Let go of the reset button. If the shortcut doesn't work, try the long way. On the Belkin Play N600 HD (F7D4301/F7D8301) model, try holding down the WPS button for 10 seconds while powering on the router. Also try the WPS instead of the reset button for the 30/30/30 reset, if you need to clear the NVRAM or having issues trying to get into the CFW Menu. 9) When logging into DD-WRT for the first time, it will prompt you to set a password. Set the password to something very simple like 'password'. (Only used temporary). 10) Navigate to the firmware upload screen, Administration->Upgrade Firmware, and then load the TomatoUSB .trx firmware file (tomato-K26USB-1.28.RT-MIPSR2-108-Big-VPN.trx). Make sure to select the "Reset to Default Settings" after flashing. 11) Connect to TomatoUSB @ http://192.168.1.1. Use admin/admin as username/password. At this point you should have TomatoUSB running on your router. Connect to your TomatoUSB router (http://192.168.1.1). Log in with root/admin as the username/password and go to USB and NAS-> USB Support (http://192.168.1.1/nas-usb.asp). Make sure the following are checked, then click [SAVE]:. Plug in your USB flash drive and USB Audio Adapter or USB Speakers. Note that your USB flash drive will be completely wiped. SSH (Putty) into your router. Use the default username and password of root/admin. From here on, most of the work will be done via the console. Don't be afraid, you can cut/paste most of the commands. Note that the router needs to be connected to the internet because we will be downloading additional software. #Got sound? Good. Lets continue. 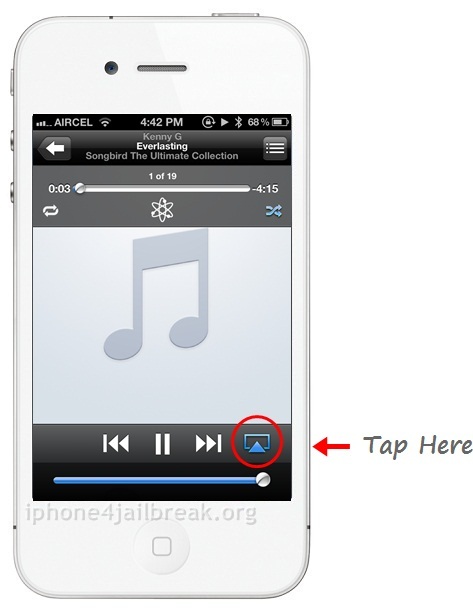 On your iOS Device or iTunes, play some music and look for the AirPlay icon. Special thanks to the Entware developers/maintainers. Entware is a replacement of optware. Please check them out - http://code.google.com/p/wl500g-repo/wiki/Goal. Please leave some feedback in the comments and let me know if you run into any issues. Questions welcomed. [Update 3/6/2013] Just got AirPrint working on TomatoUSB also. Check out the tutorial below. Sorry, at this time, AirPlay and AirPrint are not compatible with each other. The AirPrint solution uses, Optware which isn't compatible with Entware. Hopefully we'll resolve it soon. 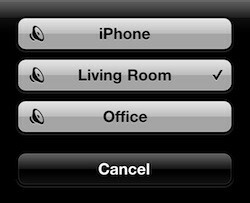 After a while I get like 4-5 "living room"s to choose from my AirPlay options. Also there is like a 5sec delay before pressing play in itunes and actually hearing music. Linksys 610N v2 (E3000) Tomato by Shibby 105. Venice, the only reason I can think of why you are seeing more than one "living room" AirPlay speaker option is because shairport some how got restarted. Try rebooting your router to see if it clears up the problem. The delay is normal due to buffering. Thanks for letting me know about the volume. I'm looking into a solution. Typically you would run 'amixer' or 'alsamixer' to control the volume which is part of the 'alsa-utils' package. However, entware doesn't have that package yet. I've opened an issue on the entware project page requesting the 'alsa-utils' package. I'm also attempting to build it myself. I'll keep you updated on any progress. Thank you, Qui Hong. Before your how-to the Shairport was a "black box" for me. Recently I've added a afpfs-ng package that helps to mount Time Capsule or other AFP shares right on router. This tutorial wouldn't be possible without you. Thank you so much for working on entware and building the shairport package. I find it amazing that here I am in SF, CA and you're in Smolensk, Russia, across the globe, and we're working together! Thanks for the guide! Got the usb soundcard to play the techno stream on my headphones, but the shairport function doesnt work. My iphone sees "living room" tries to play there, fails and then pauses the music. Dmesg didnt have any related output, any ideas? For a short period of time a few days back, there was a newer version of shairport available on in the entware repo that required additional arguments to start up properly. That package has seen been reverted. Another thing to try is to manually start shairport and enable verbose logging to see if there's any obvious errors. "shairport -a "Living Room" -b 282 -v"
any chance either of these factors would cause shairport not to function? I have shairport4win on two of my comps and it works great! Awesome tutorial. Easy to follow. Finally got my diy airplay setup running! Props to you dude! Would it be possible to have a custom tomato build with shairport integrated though so we dont have to connect a flahsdrive? Thanks for the positive feedback. There is zero chances of a custom firmware with shairport integrated. :) I highly doubt it would fit on a 8MB flash. Care to share details on your diy airplay setup? I'm trying to install Tomato with AirPlay on my Belkin PlayMax N600HD router. Everything going fine till "opkg install shairport". Every install attempt finishes with "* wfopen: /usr/sbin/shairport: Read-only file system" error. I understand that there is a problem with chmod(? ), but I don't know how to fit it. Any ideas what to do? One more question: is delay 8-9 sec normal? Shouldn't be like 2-3 sec? So I can get it working via ssh, but when I add the lines to the mount/unmount and reboot the router it never starts again? Any ideas there? I'm running toastman...not sure if that's the issue with that? I also used the "tomato-F7D3302-1.28.7501.3MIPSR2Toastman-RT-Mini.bin" for the initial flash because the DD-WRT file you posted above wasn't working on my router. Thanks for pointing that out the run on command. Sometimes when I edit the tutorial, the editor sometimes doesn't behave properly. Let's chat on testing the sound and newer version of shairport on the tomatousb.org forum. As said.. kind of new to this, so wasn't aware it should be two lines. It seems to be working fine with out the nvram commit? Please post a link to the thread on tomatousb.org, where the Airplay is discussed. I've updated the tutorial with instructions for adjusting the volume and a link to a newer version of ShairPort if you're interested in testing it. will you please make airplay available via ipkg? I'm working on it. Compiled already but not working properly and/or not tested. Once it's working I'll post a updated tutorial. "insmod: can't insert '/opt/extras/soundcore.ko': unknown symbol in module, or unknown parameter"
Did you use the same firmware as the tutorial? If not you need to find the extra modules compiled for your firmware to make it work. no, i use dualwan firmware(1.28.0542 MIPSR2 K26 USB 8M). do you know how to find the correct extras.MIPS2 modules? I went back to trace the steps and I am getting a failed message when starting the "S20dbus" dbus-daemon. 1) This section should have taken care of mount /opt on reboot via fstab. Since you did this on an existing setup using a different firmware, I'm assuming your flash drive was not label as "optware" which is what is expected. 2) Do you have this section in the run after mounting section? Yes, I have them, but dbus still fails to start after rebooting. Until than everything works as described in this how-to. After umount /opt - reformat the "optware" partition - reinstalling opkg, dbus and avahi everything goes ok again. I had the same problems with /opt and dbus. "rm /opt/var/run/dbus.pid" instead of "rm /opt/var/run/dbus/pid". Now I'm up and running! Thanks a lot! Thanks for letting me know. Might be dependent on the dbus package used. I'll update the tutorial to delete both files (in case either one exists). I went ahead and updated the location of the dbus pid file in the tutorial. Looks like the dbus package in entware was updated and the pid file location changed. Is there a way to do the set up on a Mac? I got through step 2, but it looks like Putty is only for Windows. Thanks. Thanks for putting this tutorial together. Everything works until I tried to start Avahi. Could not receive return value from daemon process. run it without the -D to see what the issue is. When I launch avahi-daemon, it creates avahi-daemon folder, but will not create the pid. I tried setting directory permissions to the entire /opt/var/run to 777 and it still doesn't make a difference. Are you starting from scratch using the Shibby's firmware and following my instruction exactly? 1. 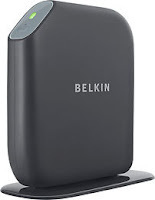 Started with a new Belkin F7D7301 v1. 3. Using DD-WRT, flashed newest current TomatoUSB .trx firmware (112, Big-VPN), with "Reset to Default Settings after flashing" set. After 5 seconds, network status briefly indicates "acquiring network address". After 13 seconds, status indicates "network cable unplugged"
After 17 seconds, router indicator light turns orange, then quickly green and stays green. However, computer continues to indicate "Network cable unplugged". Disconnecting and reconnecting ethernet cable does not change anything. B. I repeated this power-cycle procedure with static IPs. Network status briefly flashes "connected" twice during the router boot, but quickly turns to "network cable unplugged" after about 17 seconds as above. Indicator light remains green. Upon plugging in power during the final 30 interval, even with reset still being held, computer indicates "acquiring network address". After about a minute, status changes to "limited or no connectivity" with an IP address of 169.254.120.104. Indicator light on router stays off and continues to stay off. Unplugging and replugging ethernet cable yields same limited or no connectivity IP address result. Router indicator light remains off. Is the router bricked? Did I flash a wrong version of Tomato? Can I get the router out of this situation? Is there a forum where I might get more help? Thanks! Doesn't sound like your router is bricked since the router indicator light is green. Try the 30-30-30 reset again and make sure you set a static ip address for your computer. With some help from another forum, I eventually solved the problem. The problem was that the NVRAM was not being cleared after flashing Tomato. I performed a 30/30/30 reset, but using the WPS button, not the reset button. This may have cleared the NVRAM. I'm not sure. I was then able to access the CFE page from the recovery mode: (holding the reset button for ten seconds while plugging in the power, setting static IP and connecting to 192.168.1.1, then selecting Erase NVRAM from the CFE miniWeb server, and rebooting). I started the flashing over from scratch, being sure to manually erase the NVRAM using the CFE page after the DD-WRT flash and after the Tomato flash. This went smoothly. So I would suggest adding a step 10.5 in section 1e) to manually erase the NVRAM using the CFE after flashing Tomato. Also, it should be noted that the 30/30/30 reset using the RESET button does NOT erase the NVRAM. I'm not sure what it does, nor what a 30/30/30 using the WPS button exactly does. Thanks for following up and posting your solution. I really appreciate that. I just noticed you didn't use the DD-WRT firmware I provided - dd-wrt.v24-15396_NEWD-2_K2.6_mini_f7d3301.bin. Instead you used a newer version. Maybe there's a bug in the newer version of DD-WRT where it ignores the "Reset to Default Settings after flashing" checkbox, which should clear the NVRAM. Not sure if you have time, but if you do, can you start from scratch and use the dd-wrt firmware I provided? I flashed numerous F7D7301 models with the exact instructions I posted with no issues. I'll definitely mention trying to 30/30/30 reset using the WPS button versus the RESET button. Thank you again. What is the speed you guys get when connected a HDD to the USB port and read/write from a PC? Assuming that the PC and the router are gigabyte connected. When using an Ext3 drive, expect 4-7Mbytes per second. Slightly less if using NTFS. Add "use sendfile = no" in the "Samba Custom Configuration" box under "USB and NAS"->"File Sharing" screen. I followed the instructions and everything worked great. However, after I rebooted the router "Living Room" was no longer available on my apple devices. Is there any way to determine what function isn't starting? Thanks. Double check section "5) Configure the router so that everything works after a reboot" and verify you have everything configured correctly. I tried to do this again and it appears the links for entware are out of date. If you have the time would you please update the tutorial. Thank you. Can you be more specific as to what link is out of date? It appears that the link is still not updated in this tutorial, although you have that updated link in your Site to Site VPN tutorial. Thanks for letting me know. I thought, I updated it, but I guess not. It's correct now (I hope). Hi Qui Hong, first of all thanks and congrats for this article! I want to ask if I could do this over the router Linksys E3000 because it has just one USB port. I've already replaced the firmware by DD-WRT. * opkg_install_cmd: Cannot install package shairport. The router is running TomatoUSB K26 VPN MIPSR1. I'll be trying to manually get the packages mentioned by the installer now but I have a feeling that I've made a fundamental mistake somewhere. According to my understanding 'mke2fs -j' creates an ext3 partition then why are you mounting it as ext2? Is there a trick that's escaping me there? Thanks, and awesome post by the way. I'm really looking forward to making this work. After this everyhing went smoothly and I want to thank you for having written this tutorial. Without this I would probably be way in the dark. My question about the ext2/3 discrepancy still stands though. And also I've noticed a significant decrease in sound quality compared to the cable. Is that normal? Should I try to buy a better USB adapter? Good catch regarding the ext2 versus ext3. Here is my explanation on the discrepancy... always format with journaling (for ext3) for flexibility. When mounting use ext2 or ext3 depending on if you're using a USB flash drive or USB hard drive. The argument is that journaling will cause the USB flash drive to wear out faster. At any rate, I just updated the echo statement to be ext3 as I think the journaling is worth the extra wear on the USB flash drive. Thanks for the updated entware install script. I thought I updated it previously but I guess not. I have another question: currently shairplay is running on a client router that I want to connect through WAN. I added a firewall rule to accept incoming TCP on port 5002 and iTunes seems to be able to connect but no sound is coming through. Are there other ports I should be opening? I followed your instructions and downloaded the same files, but it may seem that I bricked my F7D4301. It all went well till the end of 1E, where I opened 192.168.1.1 and repeatedly entered admin/admin, but that combination didn't work, and all of a sudden, the green light in modem disappeared, and no light would show on. I tried a 30-30-30 using WPS and reset buttons, and tried pressing WPS for 10 seconds upon start, but to no avail. Also, there is no light coming from the ethernet plug in my pc. When I insert a USB stick in one port, its light turn on for a split second then disappears, while the other makes the USB light constantly on. Sorry to hear you're having issues with your setup. I don't understand how it's possible to "all of a sudden" brick your router while entering the login credentials. My only suggestion would be to try to reset it somehow. Can you please confirm that you actually used the files I provided in this tutorial versus files you got from somewhere else? You stated you use the "same files", however the link to the DD-WRT firmware from the F7D4301/8301 returns a 404 so I'm a little confused. Yes, that is confusing, but do you have any advise on how to reset it? Whatever I know about resetting the router has been documented in this blog post. My only recommendation is to keep trying. The Belkin routers uses a CFE menu which makes it very difficult to brick (even with a bad flash). The FTP link you provided didn't work. I want to know exactly what DD-WRT bin file you used and where you got it because I've seen this issue reported before (not being about to login with admin/admin after flashing to TomatoUSB) when using other versions of DD-WRT bin file. It's like there is a bug in the firmware where it ignores the "Reset to Default Settings" in step 1e, 10. Strange, the link you provided still doesn't work. Anyways, that a look at this thread - http://www.dd-wrt.com/phpBB2/viewtopic.php?t=78042&postdays=0&postorder=asc&start=345 (@lolekthegreat posting). Sounds like what I suspected, the NVRAM not being properly cleared when flashing from DD-WRT to Tomato either because the "Reset to Default Setting" wasn't checked (you did check it right?) or it wasn't honored (a bug maybe). Sounds like you might have to recover via serial or jtag. You should be able to reset the NVRAM somehow or get back into the CFE menu to reflash. Thanks for the help. I am certain that I selected to clear NVRAM when uploading dd-wrt, but if I recall correctly, I didn't wait enough after that. I only waited till I was able to access the admin page in dd-wrt, and then immediately uploaded tomato file. Could this be the issue where there wasn't ample time for modem to clear nvram? I just assumed that as long that I can access the admin page, then upgrade of dd-wrt is done. You won't believe it, but I simply left the router powered on for 24 hours, and then did a 30/30/30 reset, and now it's running Tomato! Thanks. @Hani, that's awesome news. Hopefully it will help some future readers. I am having problems loading the last 3 modules, it says they are incompatible. Can you advise on how to fix? I tried a couple of different versions, but without success, so before I downgrade my router back to 108, can you give me an idea of the audio output quality? Can you get the full audio spectrum up to 20KHz, or is it more like PC quality with some slight chopping or distortion? There seems to be some other new problems with this tutorial with some of the updates to Entware and shairport. Despite this error, I was able to install a newer, updated version of shairport through a simple command in opkg. Is this error occurring because I'm running a newer, updated version of shairport that cannot use the usb audio drivers that worked for the older version of shairport? Qui Hong - thank YOU for this great tutorial. I can confirm that I had to create the /dev/snd folder and symlinks as well in order for shairport (2014-10-28-2) to work correctly as well with shibby v128 installed. Thank you very much for this tutorial - very helpful! @GMK JuiCe, thank you so much. My router settings got erased and I had to reinstall. I was completely stuck until I used your added commands. I can't comment on the issue with the shairport version provided by opkg. My recommendation would be to run a "opkg install wget" to get the version of wget that supports https. Any chance you'd be interested in figuring out how to get the most recent update of shairport (2014-08-22) working with this setup? I'm really hoping the latency issue with this setup could be resolved (or at least a bit better) with the update. Thanks for the detail info. I'll probably move the shairport package to a non https URL in the near future to simplify things, but for now, I'm sure you're info will help others. Sorry, this is not something I'm working on any longer. Any update will not reduce the latency. Installing the VPN version of AdvancedTomato got rid of those errors. 3) For step 4, follow the directions of Alden Smith (Dec 6, 2015), NOT the directions in the main post. 4) In order to get the system to work properly on startup, I had to insert a number of sleep commands. I'm not sure why, but it seems tomato is so busy on startup that it fails to load some things if the sleeps aren't here. Here's my startup script, for Step 5. Shutdown script is the same. We are ultimately right here. If you want to invest your nights how to create account at netflix you will secure free Netflix Accounts and Passwords which working in 2018.